The very historical existence of the Samanids and they devoution to Islam and Sunnism is an ever sticking thorn in the throats of the extremist Twelver Shia (Rafidah) ruling establishment of modern day Iran and Persian supremacists alike who both hold deep grudge for orthodox Islam (Sunnism) and the companions of the Prophet Muhammad (peace be upon him) who defeated the tyrannical Sassanian (not to be confused with the Sunni Samanids) empire during the era of caliph ‘Omar Ibn Al-Khattab (may Allah be pleased with him). These two groups have brainwashed several generations of Iranians ever since the heretical minonirty of twelver Shiism was forced upon most Iranians (in particular ethnic Persians). Iranians were told that from day one, ever since the “Arabs” (i.e. Muslims, they always refer to Muslims as Arabs!) invaded (read: blessed Persia with Islam and Tawheed) Iran, the Iranians never accepted Islam, they tried everything to refuse it and were more inclined towards Shiism as it was more pro-Persian. Finally they created a new Persian identity, a mixture of Pre-Islami Persian-Majoosism (Zoroastrianism) and Islam, which resulted in the formation of Shiism. The above is a very common narrative among Persian supremacists and religious Iranian Shias alike (with the later emphasing slightly more on the Islamic character of Shiism, nonetheless supporting its Zoroastrian elements such as the celebration of Nowrooz and other pagan rituals that have become essential parts of Twelver Shiism). The aforementioned narrative has produced generations of Iranian (Shia and nationalist) youth who in one way or other hold grudge against Islam, the great great companions of Prophet Muhammad (peace be upon him) and Arabs, ignorant of the fact the the most noble of their forefathers such as the Samanids championed Islam, Sunnis and the language of the Qur’an (Arabic) while at the same time staying true to their Persian origin i.e. Islam was seen by them as the truth, the religion of Arabs and non-Arabs alike which corrected the corruption that had befallen previous religions (such as Christianity, Jewism and Zoroastrianism that could have possibly in its original form be a religion from Allah). The Samanids patronised Arabic to a significant degree but never denied their oirign. In a famous edict Samanid authorities declared that “here, in this region, the language is Persian, and the kings of this realm are Persian kings.” yet modern day Persian supremacists and extremists Shias of Iran have the audacity to claim that Islam in its Sunni form is incompatible with Persian culture , what a ludicrous notion considering that many Persians remained Zoroastrian during Arab rule and only became a majority Muslim nation during the Persian Sunni rule of the Persian Samanids. What an ironiy for those who claim that Arabs enforced Islam over all Persian when it fact Persian Muslims themselves were the cause for Islam winning the hearts of all Persians, without the need of a single sword. The Samanids were proud of their Persian heritage, Islam, Sunnism and the Arabic language. Islamic architecture and Islamo-Persian culture was spread deep into the heart of Central Asia by the Samanids. Following the first complete translation of the Qur’an into Persian, during the 9th century, populations under the Samanid empire began accepting Islam in significant numbers, besides, 900 years of Persian Muslim history was Sunni (Iran is majority for less than 500 years, during the era of the Safavids) and the very first Persian empire after the fall of the last Arab caliph was an empire formed and lead by the most noble Persians who devoutly raised the flag of Islam and spread Sunnism and cultured the Arabic and Persian language alike. The Samanids were so zealous that through missionary work converted the central Asian Turks to Islam and later under the Ghaznavids (Turko-Persian Sunni Empire!) more than 55,000 under the Hanafi school of thought. The mass conversion of the Turks to Islam eventually led to a growing influence of the Ghaznavids, who would later rule the region. These are all historical facts, however, the Iranian media is almost fully in the hands of either extremist Iranian Shias or Iranian (mostly ethnic Persian) supremacists who will either distort this historical fact or chose to not mention it at all as it remains a thorn in their throats, debunking their lie that all, or at least most Persians throughout history refused Islam to the best of their ability, to the extent of mixing it with their own customs to create a Persian Shiism. Nothing could be further from the truth, whereas it is certainly true that from day one a minority of Persians filled the ranks of the biggest enemies of Islam (like Abu Lu’lu’ah), yet this minority group – throughout Persian Sunni history – had never the upper hand, they did not represent the majority of Persians who did not just accepted Islam and Sunnism, but championed it (along with the Arabic language) wherever they could (Persian Sunnis propagated Islam in the horn of Africa-Somalia all the way to Indonesia!). 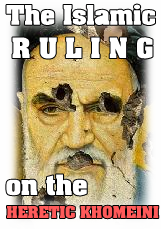 It was only when the Turkic Safavids conquered Persia and enforced Twelver Rafidi Shiism upon the majority of the people in Persian lands when this minority became the majority and ever since then spouts its historical distortion and tries to waterdown the Persian Sunni history of Iran, such as Persian Sunni Samanid empire that was more Persian than all those wretched enemies of Islam who claim Persian ancestry, Shias and supremacists alike. and all praise is due to Allah. This entry was posted in Sunnah & Rafidi-Shia history of Iran, Sunni Persia's service to Islam, The People of the Sunnah in Iran. Bookmark the permalink.